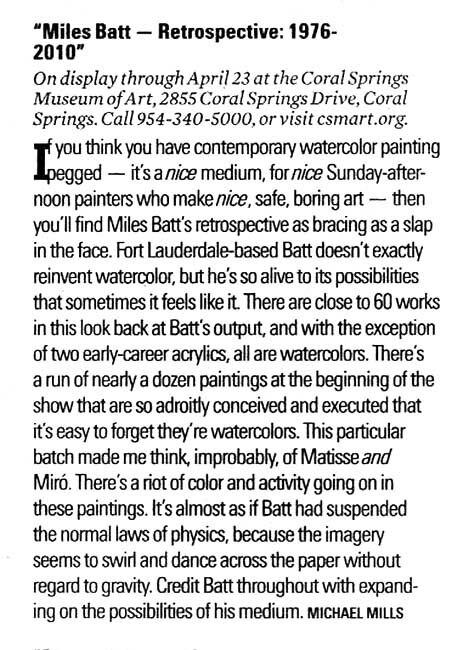 Miles Batt, of Fort Lauderdale, Florida, is nationally known for a singularly personal style that emphasizes an inimitable perception of the world around him. His credentials include over two hundred twenty five major awards. Elected to fifteen watercolor societies, including NWS, AWS, and Watercolor USA Honor Society, he is the author of, THE COMPLETE GUIDE TO CREATIVE WATERCOLOR. "Rather than replicate the limitless unorganized natural world, my desire is to invent a visual condensation that allows nature to reassert itself within the boundaries of the two dimensional surface. Aside from the capacity to accomplish essences, (thingness), more importantly, abstract forms create a formal universe parallel to creation at large." 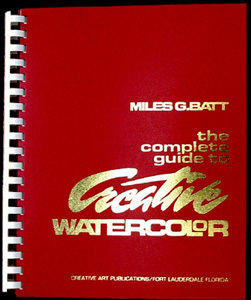 203 creative pages for the painter in any medium. $45. Incl. Media Mail shipping. "Understanding design, color and the creative process serves as the springboard for underscoring an individual concept. We are living in an intense time, our paintings should be equally unique."